A prolific perennial that is widespread throughout the prairie regions. Deer, goats, sheep, and cattle will not eat this plant. 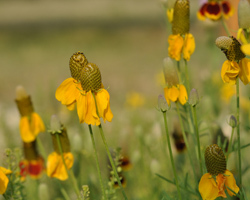 Prairie Coneflower is often a dominant plant in heavily grazed areas of the Edwards Plateau. Good nectar plant for butterflies. Maroon-yellow blooms are commonly called Mexican Hat. Grows from Minnesota to Montana to Louisiana and Mexico.